When Carmen Krogh talks about the health effects of wind turbines, she speaks from experience. She shared that experience with the councillors of Killaloe, Hagarty and Richards Township at last week’s regular meeting. Extra chairs had to be pulled out of storage to handle the large crowd that came to hear her presentation to council. Krogh has been involved with health care for more than 40 years; she is a retired pharmacist; she was the director of pharmacy at Edmonton General Hospital; when she moved to Ontario, she set up the drug information pharmacy at Ottawa General Hospital, where she researched drug therapies and advised doctors. For 15 years, she was the director of publications and editor-in-chief of the Compendium of Pharmaceuticals and Specialties (CPS); she was an acting director for Health Canada’s Pesticides Agency and has sat on numerous boards and committees dedicated to health. She has also lived near wind turbines. Her symptoms came on quickly, she said. She experienced bad headaches, dizziness, queasiness, a heart rhythm sensation and a vibration inside her body. Her health improved when she and her husband, who was not affected, left the area. She decided to research the issue. Krogh referred to a study of 10 families conducted by Dr. Nina Pierpont, whose book about wind turbines and health effects is soon to be released. She studied the families before the turbines were erected and after their installation; nine of the families have moved away permanently and the other would like to but cannot afford to move. Dr. Pierpont also recommended an epidemiology study be conducted. The Wind Energy Association disagrees with Dr. Pierpont’s findings, and raised questions about the scientific validity of her research (even though her book has not yet been released), Krogh said. Krogh also brought up the findings of Dr. Robert McMurtry, who originally wanted to host a set of wind turbines on his property. After researching them, he too became concerned about the effects on human health. In November of 2008 he did a deputation to Prince Edward County and suggested the county shouldn’t proceed in development until authoritative guidelines are in place–guidelines based on epidemiology specifically targeting health effects. One mayor in the county stated it didn’t mean the county was against wind energy, but it would give council time to get answers to the questions that citizens should be asking. “We’re the citizens and we should be asking questions,” said Krogh. Though the health issues are not limited to one group, pre-existing health conditions can be made worse by the turbines; for example, more frequent and severe migraine attacks can be triggered; balance can be affected by the visual disturbance of moving blades or shadows of the blades on the ground. Some people are affected quickly and others don’t develop symptoms for two or three months. The cause of the effects is low-frequency noise, which, Krogh said, affects the body’s neurological system. There are two types of noise from the turbines, she said: what you hear, which is measured in decibels, and low-frequency noise that you can’t hear. She referred to one study, which concluded low-frequency noise up to three kilometres away can cause sleep disturbance, and, from 300 metres away, can cause sleep disruption and serious medical problems. A 27-year study found exposure to low-frequency noise causes the cells in the body to undergo pathological changes. A three-year study added to the long one concluded that turbines in residential areas produced an acoustic environment that can lead to Vibroacoustic Disease. Krogh said the Ministry of the Environment does not measure for low-frequency noise; its guidelines are based on decibels. “In our haste to capture wind, there is no voice heard for public health, and when it is heard, it’s routinely ridiculed,” said Krogh. Krogh gave examples of “victims” of the wind turbines. 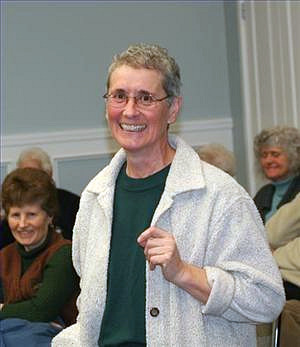 One was a healthy Shelburne woman who had 11 turbines west and east of her home. Both she and her husband developed health problems–even their dog was adversely affected. “Public health scandals happen and I’m almost on the verge of saying the wind issue will be one,” Krogh said. “Maybe it needs a groundswell from the public as a whole to say that we need to look into this further,” she said.